Our trip to Colorado and Wyoming was full of fiber and family which is perfect in my mind. This is the trip that Steve masterminded after I told him last fall that I don’t need more “things” for gifts. I have more than enough stuff and would prefer experiences. He got on the ball by looking in one of my Spin Off magazines and at Christmas proposed that we take a trip to Colorado and Wyoming as my gifts for 2016. The timing was centered around Interweave’s Yarn Fest in Loveland CO and our children joined us for parts of the trip. The next day I took a day long class on Fiber Prep with Esther Rogers, another well know spinning teacher. I enjoy Fiber Prep as much as and maybe a tiny bit more than spinning. I knew that she would give tips on creative out of the box ways to use fiber prep tools and I wasn’t disappointed. 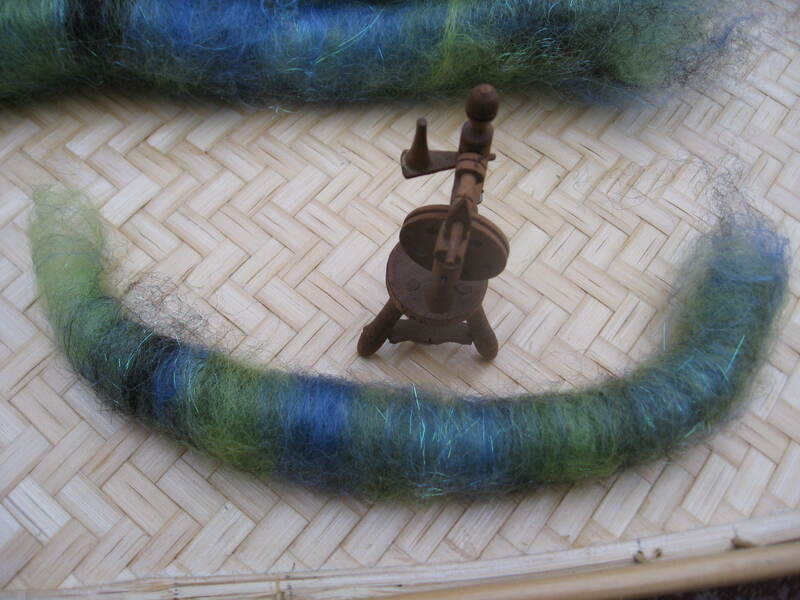 I learned different ways to use the drum carder and blending board to create unique fibers to spin. 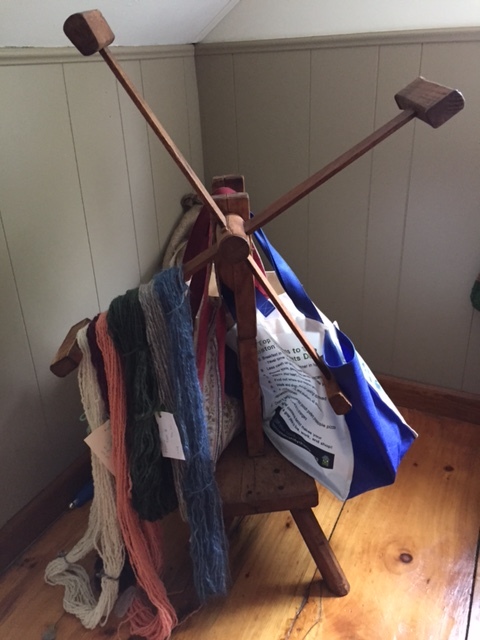 One fun thing she did was to literally cram as much diverse fiber onto one little drum carder with long teeth as she could to produce art rolags. 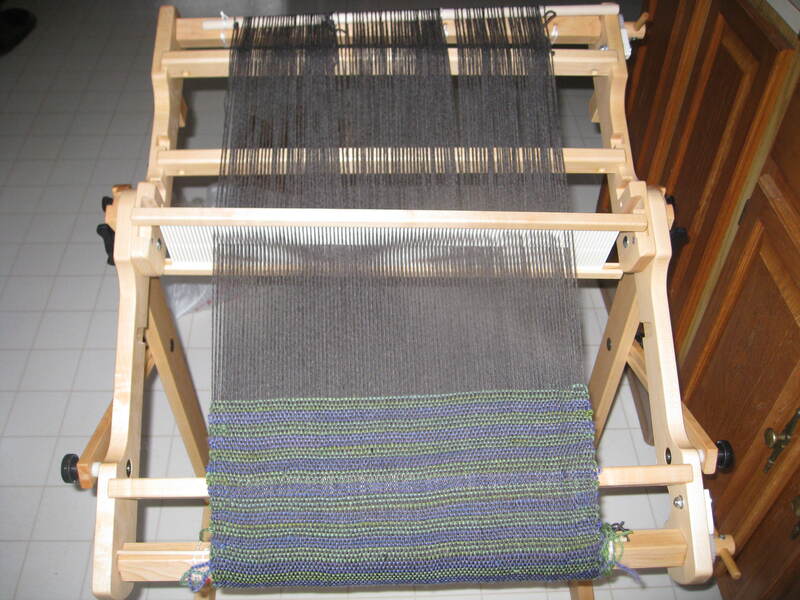 Art means the rolags will have many textures from different fibers and will be colorful. The yarn spun from them will have those characteristics too. It won’t be a smooth predictable yarn. One night we had dinner with cousins from Denver. We were able to meet my cousin’s young grandson for the first time and figured he would be my third cousin but our sons first cousin once removed following genealogy terms. All we will probably retain is that he’s a cousin. A very nice cousin. My quilt from my grandmother Burnham. The lighting isn’t so good. Here is one of mine with the same flower material. Mine is more faded. She also gave me a bowl that had belonged to our grandmother. It says Western Stoneware Co. on the bottom and is quite heavy. I couldn’t resist getting some of my sourdough starter going in it the very day we returned home. Steve had told her that the shovels used to dig the original railroad were made in our town at the Ames Shovel Factory which is now condos. She said there was a monument to the 2 Ames brothers who we knew in addition to providing shovels were also in charge of completing the intercontinental railroad at the behest of President Lincoln. We had no idea the monument existed. Several town buildings including the high school and library in our town were named for the Ames family and their historic homes are now parks and we know their history well. So, we found ourselves sort of in the middle of nowhere (I say that fondly) looking at a picture of North Easton MA containing a building we recognized. At the end I was ready to get back to my cat and chickens. I missed seeing their little faces every day even though I knew they were being thoroughly spoiled by a neighbor. We were blessed with a wonderful trip. This entry was posted in Uncategorized and tagged Ames monument Laramie WY, art spinning rolags, Esther Rogers, fiber drum carding, hand spinning, Historic Nebraska quilts, Interweave's yarnfest, Laramie WY, Maggie Casey, North Easton MA, quilts, Shuttles Spindles & Skeins, vintage stoneware, Western Stoneware Co, wool spinning wheels on April 15, 2016 by Betsy Alspach. We’ve had a few moves in the past few years and some of our things stayed behind. Everything is with us now. 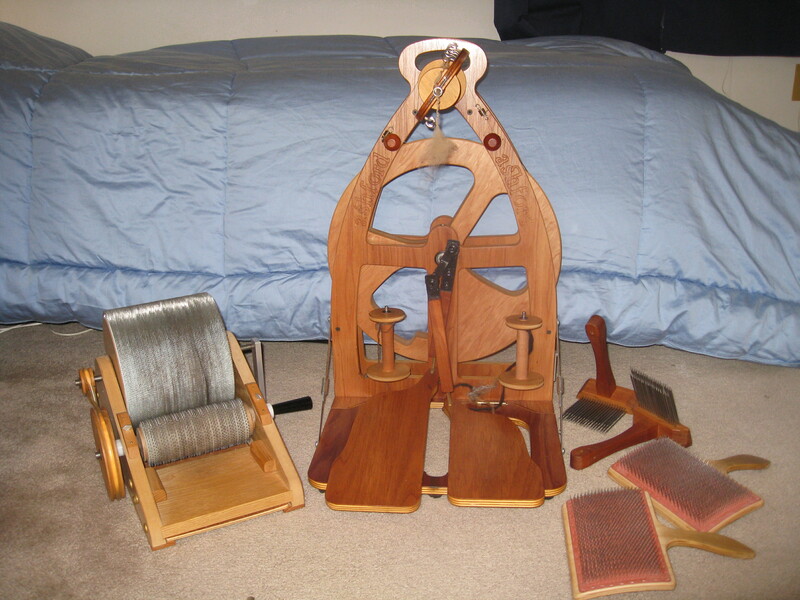 My Ashford Joy wheel and my fiber processing tools were at my side every step of the way. As was my spinning partner. Is she trying to correct my technique? Friends don’t let friends spin alone. Apparently. Now I am renewing my acquaintance with my first wheel, a Country Craftsman. The Joy is much easier to transport when spinning with friends and I was having some trouble with the drive band falling off the Craftsman as I spun so it hasn’t done much for a number of years except look pretty and sometimes be a prop when I took pictures of my yarn and knitted items. But today I decided to try it again and if I had problems that would be hard to fix I would, well, do something else so it wouldn’t take up space in this small house. My test was to see if I could spin ten minutes without a problem and it spun like a breeze. Maybe it healed during its long rest. There are many differences between the Joy and the Craftsman besides ease of transport. Although I didn’t know any of this when I bought each I now know that the Craftsman can spin faster because of its construction. When I was taught to spin years ago I was taught to create different yarns by how I used my hands and feet rather some of the more technical methods that people with technical minds, and I am not in that category for sure, can now apply to get yarns with certain attributes. So I have studied the technical ideas just to understand them simply because I want to know everything about spinning even if I don’t use it. I do pay attention to ratio but that is for another time. The rest, for example twist angle of the yarn-I won’t explain it because my eyes are glazing over even as I only type it much less try to use it- is knowledge but doesn’t enter in to the ways I use to create the yarns I want. Different strokes for different folks. I have a few other truly antique wooden friends I have been using right along. Several years ago while on PEI I bought a smaller old wool winder that I use all the time for the purpose for which it was made. I love the big old nails, and in one spot I can faintly see the penciled name Mrs. Mary Mc (I can’t read the rest of her name) which makes it even more fun to use. 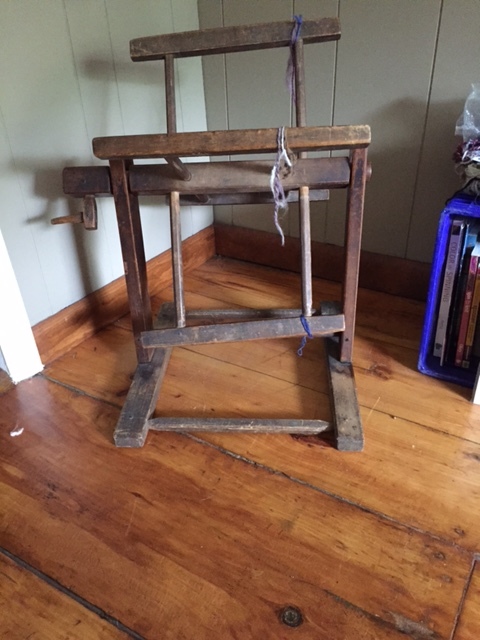 It is very rustic and may have been made by Mr. Mc…I also have a large clock wheel wool winder given to me years ago by a friend which now is mostly another nice prop for my yarns and project bags. 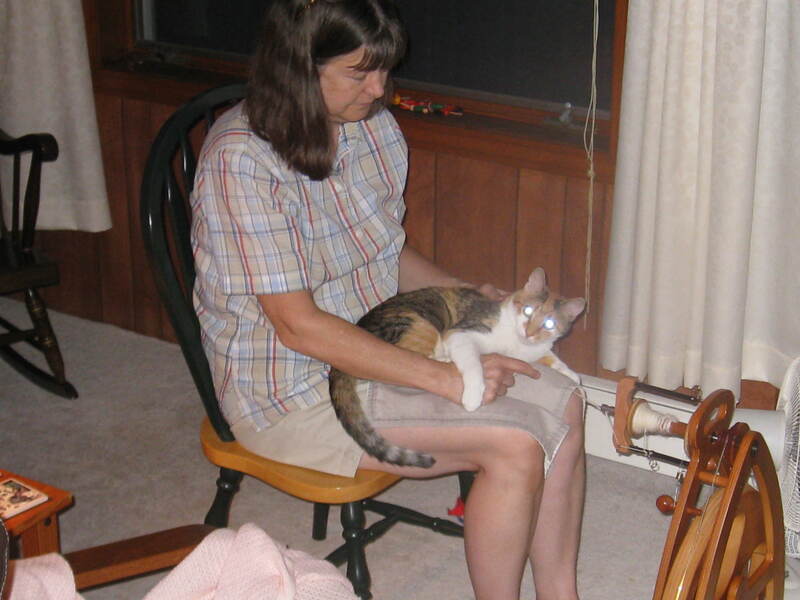 Human friends and family, pet friends, perennial flower friends, spinning wheel friends- they all bring warmth to our lives and we can never have too many. Except maybe too many pets at one time! 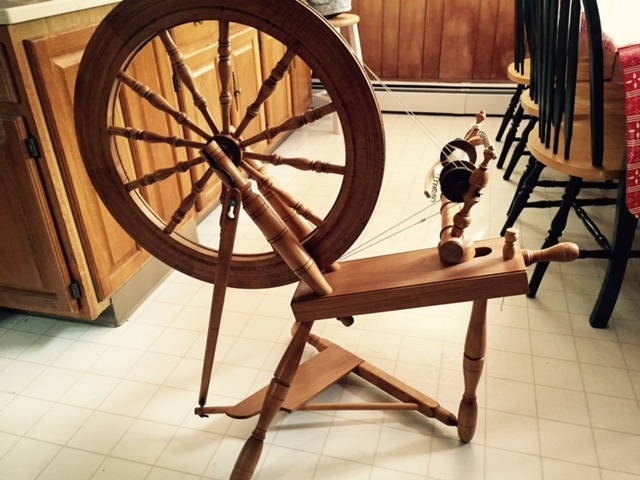 This entry was posted in Uncategorized and tagged antique wool winders, Ashford Joy spinning wheel, cats, Country Craftsman spinning wheel, old friends, rigid heddle looms, spinning, spinning wheel, spinning wheels, wool spinning wheels on June 3, 2015 by Betsy Alspach.